Chester Stewart hit junior wide receiver Jason Harper for a 58-yard bomb and senior wide receiver Bruce Francis for a 3-yard touchdown, but other than that, it was a day full of overthrows, interceptions, aimless dancing around in the pocket and frustration. Once again, freshman Kee-ayre Griffin was terrific, rushing for 84 yards on 12 carries, highlighted by a 29-yard scamper and a 17-yard touchdown run. Redshirt freshman Joe Jones was mostly grounded, averaging just 2.5 yards per carry and yielding carries to Griffin as the day went on. Senior Travis Shelton didn’t catch a pass. That can’t happen. Francis, as usual, led the way with six catches for 74 yards, including a near-miracle catch in the fourth quarter, but junior Dy’Onne Crudup crashed into him, jarring the ball loose on the fourth down Hail Mary. In addition, there were too many drops and too many times where Stewart had nowhere to go. As usual, the holes were there and the protection, for the most part, was there, as Stewart was sacked only four times. But penalties, headlined by senior Alex Derenthal’s holding call that negated a 37-yard run by Griffin, continue to bring things down. Freshman Steve Caputo was also lost for the year with a knee injury, so the Owls will now be a little short-changed on the offensive front. Junior defensive end Brian Sanford narrowly misses a tackle (Jessica Scott/CM-Life). The Chippewas averaged just 2.65 yards per carry, plus junior Junior Galette’s three sacks and junior Brian Sanford’s one, added to the stellar day for the Owls’ front four. They were constantly in the Central Michigan backfield, causing problems all day for whoever was running the ball and whoever was passing it. Sophomore Amara Kamara delivered some big time hits with his four tackles, and this group did a fairly good job of limiting big runs by the Chippewas. They also controlled the middle of the field better, but that had more to do with Central Michigan’s style of offense than anything else. This unit limited the big plays, which are what they preached. But junior wide receiver Bryan Anderson caught eight balls for 149 yards and one touchdown, plus sophomore wide receiver Antonio Brown chipped in with two touchdowns of his own. 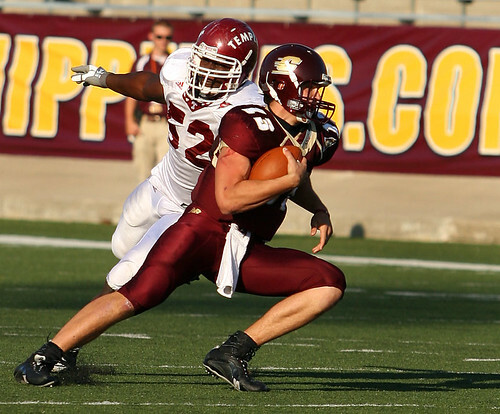 Yes, Central Michigan is a passing team, but all those slants and posts they easily completed needed to be contained. But, outside of the first two drives, those completions didn’t amount to much. So, they bended, but didn’t break, and that’s not all that bad. Redshirt junior Jake Brownell was simply awful, missing an extra point and not even coming close with a 45-yard field goal attempt. Sophomore Jeff Wathne hit two of his five punts inside the 20, continuing his strong play this year. After a while, the lack of discipline on this team and the consistent untimeliness of the penalties have to reflect on Golden. But, he can’t throw Stewart’s passes for him, nor can he hold onto the ball. So, he can’t be blamed for everything. Plus, his defense continues to shine, so it’s not all bad. But, the lack of a kicking game affects the offensive calls near the redzone, and it doesn’t take a genius to figure out that the Owls are going to need to improve things offensively to compete. The Owls came out of these two tough back-to-back road games alive, and now a weak Ohio team awaits them at the Linc for a nationally televised game next Tuesday. While the Owls have come away empty-handed too often this season, they are still in a halfway decent overall position in the second week of October, so there’s that. Grade: It’s all on the line next week, you betcha.